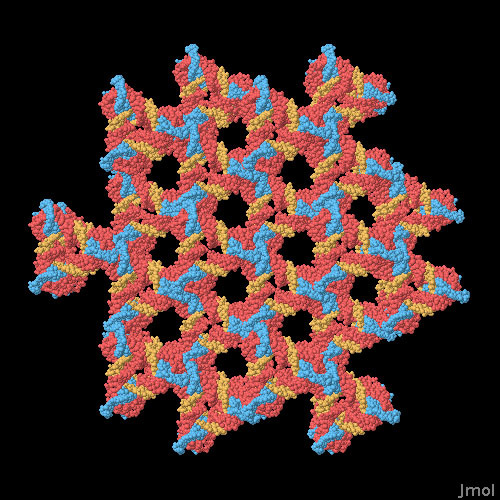 Three engineered strands of DNA assemble into a triangular module (top) that self-assembles into a two-dimensional lattice (bottom). DNA is a perfect raw material for constructing nanoscale structures. Since base-pairing has been selected by evolution to be highly specific, it is easy to design sequences that will link up with their proper mates. In this way, we can treat small pieces of DNA like Tinkertoys, designing individual components and then allowing them to assemble when we put them together. In addition, the chemistry of DNA synthesis has been completely automated, so custom pieces of DNA can be easily constructed, or even ordered from commercial biotech companies. This puts DNA nanotechnology in the hands of any modest laboratory, and many laboratories have taken advantage of this, creating nanoscale scaffolds, tweezers, polyhedra, computers, and even tiny illustrations composed entirely of DNA. DNA has the characteristic mix of flexibility and rigidity that is the hallmark of biological molecules. If the sequence of bases is correct, it zips up into a double helix that, at least in short lengths, is a sturdy cylinder. Longer stretches, however, start to show flexibility, and the DNA helix curves and bends. The trick in designing a DNA infrastructure is to develop ways to rigidify the overall structure. In most cases, this has been done by having the DNA strand weave back and forth between many parallel double helices. In this way, the bundle of helices form a structure that is far more rigid than a single helix. Nadrian Seeman pioneered the use of DNA for building nanoscale structures. 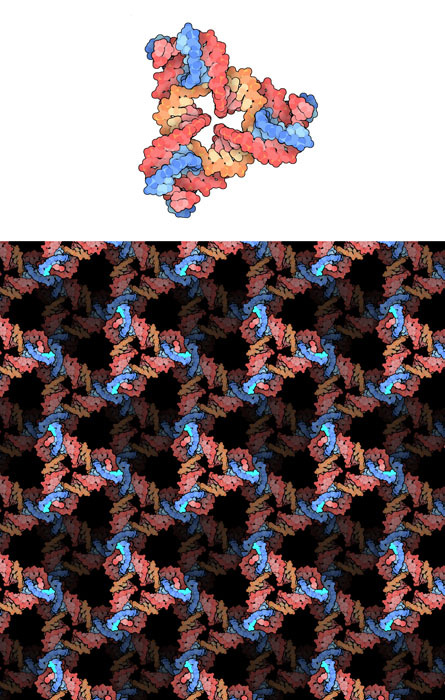 After decades of work, the structure shown here, from PDB entry 3gbi , is the first crystal structure of a DNA lattice completely designed from scratch. It is built of small 3D triangular subunits, each composed of three separate types of DNA strands. The base sequences are carefully chosen so that they assemble into this one particular structure, and not any others. At the corners of the 3D triangle, there are sticky ends that link to other triangles, stacking up in a predicable way into a three-dimensional scaffold. These scaffoldings are the first step towards the larger goals of nanotechnology. Two major applications of the scaffold have been proposed. First, the spaces in the lattice may be used to host other molecules, like proteins, providing a general way to orient many copies of the particular molecule. This would allow the determination of the structure by x-ray crystallography without the need to crystallize the protein by itself, which is always a hit-or-miss proposition. The second application is for building nanoscale electrical devices. In these speculative structures, individual nanotech electrical components would be placed at the nodes in the scaffold. Since the base sequences of the DNA lattice are known, special connectors could be designed to attach the components in exactly the right place. DNA with sticky ends self assembles into larger structures. The small DNA double helix in PDB entry 309d was the first step towards the construction of the DNA lattice. It shows that DNA sticky ends are useful for creating extended structures from small components. It is composed of a small strand of 10 bases, which associate into a helix with two bases exposed at either end. Then, many of these small helices stack up to form a long helix. This same principle is widely used in biotechnology: first the DNA is cut by restriction enzymes that create sticky ends at the site of cleavage, then the pieces are reassembled and reconnected with DNA ligases. PDB entry 3gbi is a DNA lattice built of three types of strands, which together form a sturdy 3D triangular building block. One of the strands, colored red here, forms the legs of the triangle. A second type of strand, colored yellow, forms a circle that links all three strands of the triangle. The third type of strand, colored blue here, forms a little staple shape that forms the double helix at each point of the triangle. Sticky ends at the points then associate to form the lattice. Click on the image here to see an interactive Jmol. You'll find that the stacking of 3D triangles is not as simple as you might think! Several enzymes that are involved in recombination create branched structures of DNA similar to the junctions in the artifical lattice shown here. Can you find examples of these in the PDB? N. Seeman (2007) An overview of structural DNA nanotechnology. Molecular Biotechnology 37, 246-257.